The Sommer Wireless Keypad with cover allows you to easily open your garage door from anywhere without the added effort of running wires. The Original Clicker. Universal Wireless Keypad provides trusted keyless garage or gate access no matter what brand of opener you have. Set up in seconds with easy-to-follow wireless programming and universal frequency recognition of over 90% of all garage door openers installed in North America, including major brands such as Chamberlain., LiftMaster., Craftsman., Genie. and many more. A perfect fit for active lifestyles, this keypad is a great complement to a traditional visor and/or compact personal remote. The Quick-Release Key guarantees garage access anytime, providing exterior manual operation of any brand of garage door opener. It allows garage access during power outages and other opener failures. Compatible with a wide range of metal or wood garage doors, this convenient option is ideal for vaulted garages with no other entry. The Universal Laser Park Assist keeps your garage safe from damage by helping you easily find the perfect park every time. Compatible with all garage door openers, the accessory activates a bright red laser beam that tracks along the vehicle's hood as it enters until it reaches the preset marker, and indicates when to stop. This lightweight parking assistant offers easy installation. The ultimate in quiet, reliable performance perfect for homes with a living space above the garage. Includes two Security+<sup></sup> 3-button remote controls, SoftGlo Multi-Function Control Panel, The Protector System Safety<sup></sup> Sensors. Lifetime In Home Warranty. Includes Wireless Keyless Entry. Wireless Keypad with Cover for 310 MHz 550 and 800 Garage Door Openers The Sommer Wireless Keypad with cover allows you to easily open your garage door from anywhere without the added effort of running wires. 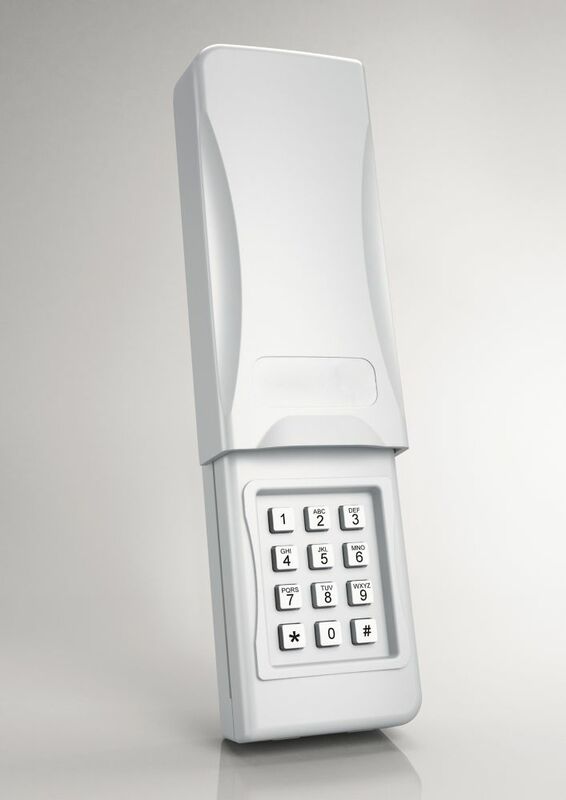 Wireless Keypad with Cover for 310 MHz 550 and 800 Garage Door Openers is rated 4.5 out of 5 by 2. Rated 4 out of 5 by Jurka from Handy to have. I’ve used this keypad for over a month without any problems. Easy to install and sync with my direct drive opener. Only negative, the cover is a little stiff to slide up but should get smoother over time and use. Rated 5 out of 5 by snowbanker from Wireless keypad instructions are confusing. The Sommer Direct Drive garage door openers are the quietest on the market and very well designed and engineered. I rate them as excellent. 5 stars. Unfortunately, the instruction manual for the openers fails to inform on how to program an optional wireless keypad designed to work with the opener. The instruction sheet for the keypad is in tiny print and a confusing translation from the original German. Go to the Sommer U.S.A. website to find a clear one page instruction sheet that tells you everything you need to know. The keypad, once programmed is exceptional - a 5 star rating.